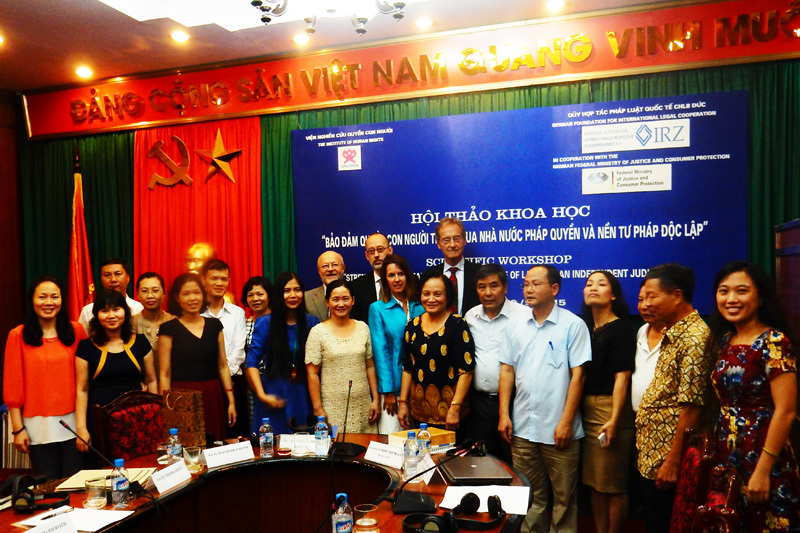 In June 2018, the IRZ together with the Vietnamese Institute for Human Rights (VIHR) organised workshops focussing on criminal law on 18 and 19 June in Hanoi and on 21 and 22 June in Da Nang. The workshops on substantive and procedural criminal law were held as part of a project supported by the German Foreign Office. The workshops were aimed at the definitive structuring of constitutional provisions. Following an extensive lead time, a new penal code and reformed criminal procedural law have been in force in Vietnam since 1 February 2018. These amendments are part of efforts to ensure respect for human rights guarantees and basic rights since the new constitution came into force in 2014. Dr. Matthias Hartwig, an academic at the Max Planck Institute for Comparative Public Law and International Law. The lectures dealt with the new regulations, such as the presumption of innocence or the video recording of hearings. The delimitation of powers of the court, public prosecutors, police and defendants was also an intensely discussed topic. Since the public prosecutor's office in Vietnam is not only responsible for criminal investigations, but also ensures the supervision of compliance with procedural regulations at court, many practical issues concerning the exercising of the public prosecutor’s duties were also discussed. Various Vietnamese speakers gave a self-critical presentation of definitive suggestions for improvement, whilst their German colleagues explained the requirements in accordance with international and German law. All those involved in the workshops displayed a clear awareness of the need for measures to be implemented at various levels. At these meetings, the changes to the consistent observation of human rights in criminal law and criminal procedural law were discussed constructively from various perspectives. The 5th International Conference on Comparative Law took place in Hanoi from 8 to 10 September on the topic of "The Rule of Law and independent Justice". 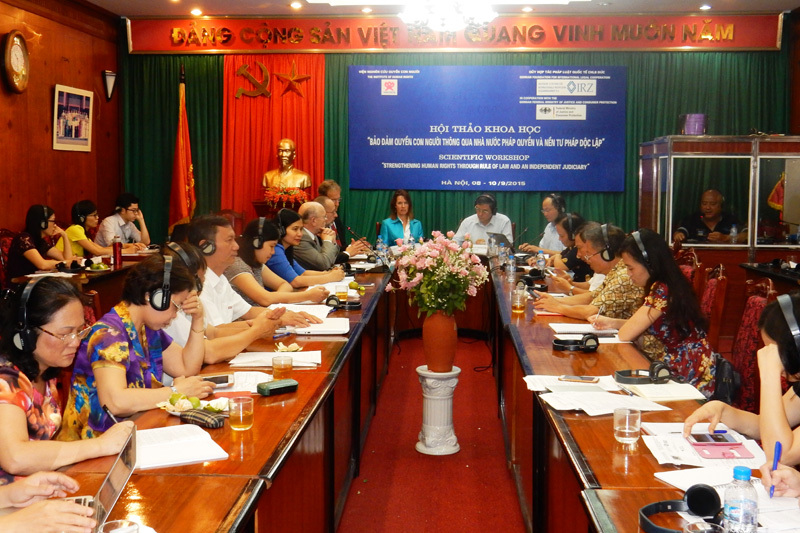 The conference was organised by the IRZ and the Vietnamese Institute of Human Rights. Attendees included the lawyer and writer, Professor Bernhard Schlink, the expert in constitutional law, Professor Bodo Pieroth, and Dr. Thomas Flint, a judge at the Federal Social Court of Germany. Since 2011, the IRZ has been organising conferences on topics concerning constitutional law in cooperation with the Vietnamese Institute of Human Rights, which is a member of the National Academy of Politics and Public Administration. 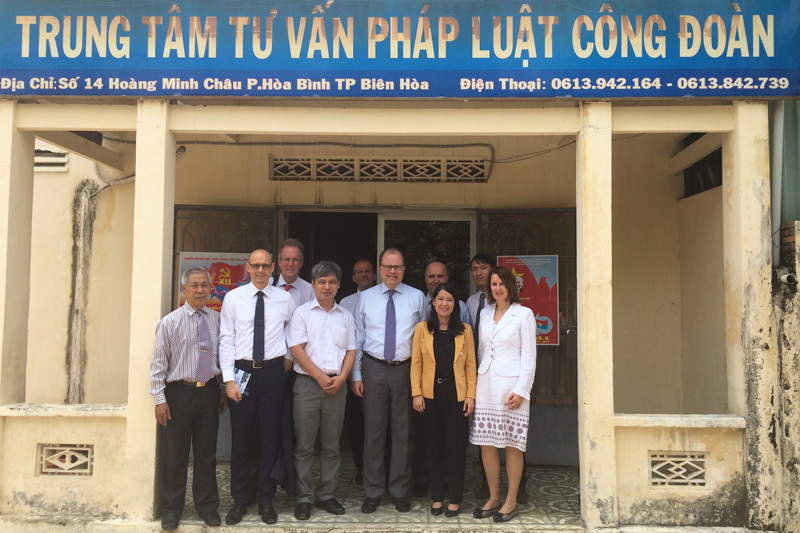 The objective of the IRZ is to help support human rights in connection with legal reforms in Vietnam and conduct projects aimed at strengthening the ongoing discussions on respecting human rights. This year's conference, which took place from 8 to 10 September 2015, focussed on the requirements for the constitutional organisation and institutional independence of the justice system as a basic aspect of protecting human rights. Vietnam has long been focussed on the objective of becoming a constitutional state and has initiated many legal reform projects. In addition, Professor Schlink and Professor Pieroth took a lecture at the Law School in Hanoi on the Principles of Proportionality (Schlink) and on the Federal Constitutional Court (Pieroth), followed by discussions with lecturers and students. Professor Schlink has made a name for himself not only as a legal expert, but also as an author. His novel "The Reader" was made into a successful film in 2008 and has been translated into more than 55 languages, including Vietnamese. The German Embassy in Hanoi therefore took the opportunity to show the film and arrange a discussion afterwards between the audience and the author, in which many young Vietnamese people in particular took part with enthusiasm. The intensive Rule-of-Law Dialogue between Germany and Vietnam was extended by three years in April by a new agreement. 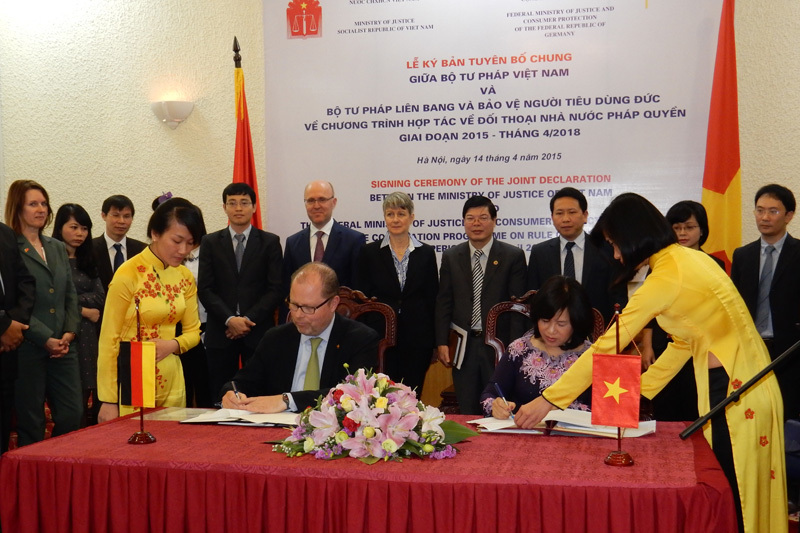 On 14 April 2015, the Parliamentary State Secretary, Mr Christian Lange, and the Vice-Minister of Justice, Ms Nguyen Thuy Hien, signed the new work programme in a ceremonial act for the period of April 2015 to April 2018. The programme is aimed at implementing the German-Vietnamese Rule-of-Law Dialogue which was initiated by a joint declaration of the two foreign ministers in 2008 and has been extended and detailed for the third time by the respective three-year programmes since 2009. This intensive cooperation in the fields of law and the judiciary underscores the close partnership between the two countries, which are celebrating 40 years of diplomatic relations this year. The Agreement is aimed at continuing the legal-judicial cooperation with the central idea being support for the rule of law and the modernisation of the legal system in Vietnam. The coming years will particularly be marked by a large number of reform processes to harmonise the existing regulations with the new constitution against the background that the new constitution entered into effect on 1 January 2014. The IRZ is an important partner in the implementation of the Rule-of-Law Dialogue and will initiate many measures under the programme this year as well. The cooperation will focus on the consultations of the Ministry of Justice and the People's Prosecution Office concerning the upcoming reforms of the Civil Code and the Code of Criminal Procedure. Numerous measures are moreover planned with regard to the further training of legal practitioners. The IRZ offers these events in cooperation with the Judicial Academy and the Bar Association as partners. The IRZ will also organise a conference aimed at strengthening human rights and the independence of the judiciary for the fifth time in a row with the Institute for Human Rights. Against the background of Vietnam's current eagerness to carry out reforms and the fact that both the Party Conference and the Parliamentary elections will take place next year, the IRZ is looking forward expectantly to the upcoming developments and projects in Vietnam.